Italian composer, was born in Palestrina (the ancient Praeneste) at the foot of the Sabine mountains, in 1526. The various versions of his name make an interesting record. He appears as Palestina, Pellestrino, Gio. Palestina, Gianetto Palestrina, Gianetto da Palestrina, Gian Pierl. de Palestrina, Joh. Petrus Aloisius, Jo. Petraloys, Gianetto, Giov. Prenestini, Joannes Praenestinus, Joannes Petraloysius Prenestinus. 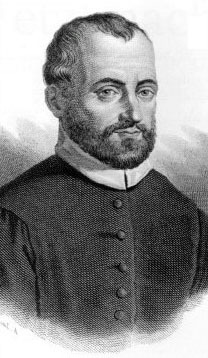 Palestrina seems to have been at Rome from 1540 to 1544, when he studied possibly under Gaudio Mell, but not under Goudimel as has erroneously been assumed. On the 12th of June 1547 he married Lucrezia de Goris. In 1551, by favor of Pope Julius III, he was elected Magister Cappellae and Magister Puerorum at the Cappella Giulia, S. Pietro in Vaticano, with a salary of six scudi per month, and a house. Three years later he published his First Book of Masses, dedicated to Pope Julius III, and beginning with the missa "Ecce sacerdos magnus." On the 13th of January 1555, Palestrina was enrolled, by command of Pope Julius III, among the singers of the Cappella Sistina. This honor involved the resignation of his office at the Cappella Giulia, which was accordingly bestowed upon his friend Animuccia. But the legality of the new appointment was disputed on the ground that Palestrina was married, and the father of four children, his wife, Lucrezia, being still alive; and, though, for the moment, the pope's will was law, the case assumed a different complexion after his death, which took place only five weeks afterwards. The next pope, Marcellus II, was succeeded after a reign of 23 days, by Paul IV; and within less than a year (July 30, 1555) that stern reformer dismissed Palestrina, together with two other married singers, A. Ferrabosco and Bari, with a consolatory pension of six scudi per month to each. This cruel disappointment caused Palestrina a dangerous illness; but in October 1555 he was appointed maestro di cappella at the Lateran, without forfeiting his pension; and in February 1561 he exchanged this preferment for a similar one, with an allowance of 16 scudi per month, at Santa Maria Maggiore. Palestrina remained in office at this celebrated basilica for ten years, and to this period is assigned an important chapter in the history of music. Many circumstantial details of this chapter are undoubtedly legends, due to the pious imagination of Baini and others. In 1562 the Council of Trent censured the prevalent style of ecclesiastical music with extreme severity. In 1564 Pope Pius IV commissioned eight cardinals to investigate the causes of complaint; and these proved to be so well founded that it was seriously proposed to forbid the use of all music in the services of the Church except simple chanting. In these circumstances Palestrina is said to have been invited by two of the most active members of the commission to come to the rescue. He accordingly submitted three masses to Cardinal Carlo Borromeo for approval. These were privately rehearsed, in presence of the commissioners, at the palace of Cardinal Vitellozzi; and the judges were unanimous in deciding that the third mass fulfilled, in the highest possible degree, all the conditions demanded. The private trial took place in June 1565, and on the 19th of that month the mass was publicly sung at the Sistine Chapel, in presence of Pope Pius IV, who compared its music to that heard by St. John in his vision of the New Jerusalem. Parvi transcribed it, for the library of the choir, in characters of extraordinary size and beauty; and Palestrina was appointed by the pope composer to the Sistine Chapel, an office created expressly in his honor and confirmed to him by seven later pontiffs, though with the very insufficient honorarium of three scudi per month, in addition to the six which formed his pension. In 1567 this mass was printed in Palestrina's Liber Secundus Missarum. The volume was dedicated to Philip II of Spain, but the mass was called the Missa Papae Marcelli. This title, clearly given in honor of the short-lived pope Marcellus II, has given rise to an absurd story, told by Pellegnini and others, to the effect that the mass was composed by Pope Marcellus I, martyred early in the 4th century, and was only discovered by Palestrina. Of course in the 4th century such music was inconceivable. The Missa Papae Marcelli is now almost certainly known to have been composed in 1562, two years before Paul IV's commission. Its ineffable beauty had often been described in glowing terms by those who heard it in the Sistine Chapel, but it was only first heard in England in 1882, when the Bach choir, consisting of 200 unaccompanied voices, sang it at St. James's Hall, under the direction of Mr Otto Goldschmidt. Upon the death of Animuccia in 1571 Palestrina was re-elected to his appointment at the Cappella Giulia. He also succeeded Animuccia as maestro di cappella at the oratory of Philip Neri; but these appointments were far from lucrative, and he still remained a very poor man. A letter of thanks for 100 scudi, written on the 21st of March 1579 to the Duke of Mantua, illustrates this situation. In 1580 he was much distressed by the death of his wife; and the loss of three promising sons, Angelo, Ridolfo and Silla, left him with one child only -- Igino -- a very unworthy descendant. In February 1581 he married the rich widow Virginia Dormuli. In 1586 Pope Sixtus V wished to appoint him maestro to the pontifical choir, as successor to Antonio Boccapadule, then about to resign, and commissioned Boccapadule to prepare the choir for the change. Boccapadule, however, managed so clumsily that Palestrina was accused of having meanly plotted for his own advancement. The Pope was very angry, and punished the calumniators very severely; but Palestrina lost the appointment. These troubles, however, did not hinder his work, which he continued without intermission until the 2nd of February 1594, when he breathed his last in the arms of his friend, Filippo Neri. Proper assessment of Palestrina's work is complicated by the march of time. So simple are the materials of 16th-century music, and so close its limitations, that the difference between great and small artists, and still more the difference between one great artist and another, can be detected only by long and familiar experience. A great artist, working within limits so narrow and yet so natural, is fortunately apt to give us exceptional opportunities for acquiring the right kind of experience of his art, since his genius becomes far more prolific than a genius with a wider field for its energies. Yet all 16th-century masters seem to be illuminated by the infallibility of the normal musical technique of their time. This technique is no longer so familiar to us that its euphony and vivid tone can fail to impress us wherever we meet it. There is probably no respectable school piece of the 16th century, which, if properly performed in a Roman Catholic church, would be quickly distinguishable by ear from the style of Palestrina. But when we find that every addition to our acquaintance with Palestrina's works is an acquisition, not to our notions of the progressive possibilities of 16th-century music, but to our whole sense of style, we may then recognize that we are in the presence of one of the greatest artists of all time. Palestnina's work has many styles. Within its narrow range there can be no such glaring contrasts as those of the "three styles" of Beethoven; yet the distinctions are as real as they are delicate. His early, or Flemish style, was apt to lead him into the notorious Flemish disregard of proportion. Yet in some of his greatest works, such as the Missa Brevis, we find unmistakably Flemish features so idealized as to produce breadth of phrase (Missa Brevis, Agnus Dei), remarkably modern firmness of form (ibid. second Kyrie), and close canonic sequence carried to surprising length resulting in natural unexpectedness of harmony and subtle swing of cross rhythm (Amen of Credo). If we find it convenient to divide Palestrina's work roughly into three types, we shall be able to take the Missa Papae Marcelli as the crowning representative of his second style. It probably is his greatest work; at all events it continues to make that impression whenever it is read after a long course of his other works; yet there are many masses, too numerous to mention, which cannot easily be considered inferior to it. Indeed F. X. Haberl, the editor of the complete critical edition of Palestrina's works, prefers the Missa Ecce ego Joannes, first published by him in the 24th volume of that edition in 1887. Palestrina scholars will hardly think us singular for placing on the same plane as the Missa Papae Marcelli at least 16 out of Palestrina's 94 extant masses: Missa Brevis, bk. 3, no. 3; Dies Sanctificatus, bk. 6, no. 1; Dilexi Quoniam, bk. 6, no. 5; O Admirabile Commercium, bk. 8, no. 3; Dum Complerentur, bk. 8, no. 5; Veni Sponsa Christi, bk. 9, no. 2; Quinti Toni, bk. 10, no. 5; Octavi Toni, bk. 11, no. 4; Alma Redemptoris, bk. 11, no. 5; Ascendo ad Patrem, bk. 12, no. 3; Tu es Petrus, bk. 12, no. 5; Hodie Christus Natus Est, bk. 13, no. 2; Beatus Laurentius, bk. 14, vol. 3; Assumpta Est Maria, bk. 14, no. 5; Tu es Petrus, bk. 15, no. 5; Ecce ego Joannes, bk. 15, no. 6. The third and most distinctive phase of Palestrina's style is that in which he relies entirely upon the beauty of simple masses of harmony without any polyphonic elaboration whatever. Sometimes, as in his four-part litanies, this simplicity is mainly a practical necessity; but it is more often used for the purpose of his profoundest expressions of sacramental or penitential devotion, as for instance in the motet Fratres ego enim accepi, the Stabat Mater and the first, really the latest, book of Lamentations. Besides these three main styles there are numerous crosscurrents. There is the interaction between the madrigal and ecclesiastical style, which Palestrina sometimes contrives to show without confusion or degradation, as in the mass Vestiva i colli. There is the style of the madrigali spirituali, including Le Vergine of Petrarca; which again distinguishes itself into a broader and a slighter manner. And there is lastly an astounding absorption of the wildest freaks of Flemish ingenuity into the loftiest polyphonic ecclesiastical style; the great example of which is the Missa L'Homme arm�, a work much maligned by writers who know only its title and the part played by its secular theme in medieval music. The works published in Palestrina's lifetime naturally contain a large proportion of his earlier compositions. After his death the publication of his works continued for some years. We are apt to read the musical history of the 17th century in the light of the works of its composers. But a somewhat different view of that time is suggested by the continual pouring out by influential publishers of posthumous works of Palestrina, in far greater quantities than Palestrina had either the influence or resource to publish in his lifetime. We regard the 17th-century monodists as triumphant iconoclasts; but it was not until their primitive efforts had been buried beneath the entirely new arts to which they led, that the style of Palestrina ceased to be upheld as the one artistic ideal. Moreover the posthumous works of Palestrina belong almost entirely to his latest and finest period; so that a study of Palestrina confined to the works which he himself was able to publish gives no adequate idea of the proportion which his greater works bear to the rest. It was not, then, the rise of monody that crowded 16th-century art out into a long oblivion. On the contrary, the Palestrina tradition was the one thing which gave 17th-century composers a practical basis for their technical training. Only in the 18th century did the new art, before coming to maturity under Bach and Handel, reduce the Palestrina style to a dead language. In the middle of the 19th century that dead language revived in a renascence which has steadily spread throughout Europe. The Musica Divina of Canon K. Proske of Regensburg, begun in 1853, was perhaps the first decisive step towards the restoration of Roman Catholic church music. The St. Cecilia Verein, with Dr F. X. Haberl as its president, has carried on the publication and use of such music with the greatest energy in every civilized country. The difficulties of reintroducing it in its native home, Italy, were so enormous that it is arguable that they might not yet have been surmounted but for the adoption of less purely artistic methods by Don Lorenzo Perosi, who succeeded in crowding the Italian churches by the performance of compositions written in an artless manner which, by its mere negation of display, was fitted to produce upon unsophisticated listeners such devout impressions as might gradually wean them from the taste for theatrical modern church music. The pope's fiat has now inculcated the use of Gregorian and 16th-century church music as far as possible in all Roman Catholic churches, and the effect has been astonishing. Within eighteen months of Pope Pius X's decree on church music, the choir of Cologne Cathedral, previously far less accustomed to a pure polyphonic style than most German Protestant choirs, at Easter of 1905 gave a very satisfactory performance of the Missa Papae Marcelli. The influence of what is henceforth an inevitable and continual familiarity of Palestrinas style, at least among Roman Catholics, cannot fail to have the profoundest effect upon modern musical culture. Palestrina's works, as contained in the complete edition published by Breitkopf and Hartel, comprise 256 motets in 7 volumes, the last two consisting largely of pieces hitherto unpublished, with one or two wrongly or doubtfully ascribed to Palestrina; 15 books of masses, of which only 6 were published in Palestrina's lifetime, the 7th being incompletely projected by him, and the 14th and 15th first collected by Haberl in 1887 and 1888; 3 books of magnificats, on all the customary tones; 1 volume of hymns; 1 volume (2 books) of offertories for the whole year; a volume containing 3 books of litanies and several 12-part motets; 3 books of lamentations; a very large volume of madrigals containing 2 early books and 30 later madrigals collected from mixed publications; 2 books of Madrigali Spirituali, and 4 volumes of miscellaneous works, newly discovered, imperfectly preserved and doubtful. The fourth book of motets is not, like the first three, a collection of works written at different times, but a single scheme, being a setting of the Song of Solomon; and the fifth volume is, like the offertories, designed for use throughout the church year.